The early morning hours of September 20th find the Union army in position and ready to react to developments. The Fourteenth Corps builds hasty fieldworks while the Twentieth and Twenty-first Corps remain in reserve, ready to move at a moment’s notice. General Rosecrans also moves his headquarters in the early morning hours. Leaving the Widow Glenn cabin, he looks for a spot more centrally located to the rest of his army. He settles on a small ridge south of the Dyer farm, whose large open fields provide a good view of the surroundings. While the Union army prepared breakfast and constructed fieldworks, the Confederates are on the move. Lieutenant General Longstreet shifts three divisions northwards, and in the processed, blocks the line of advance of Cleburne’s Division. 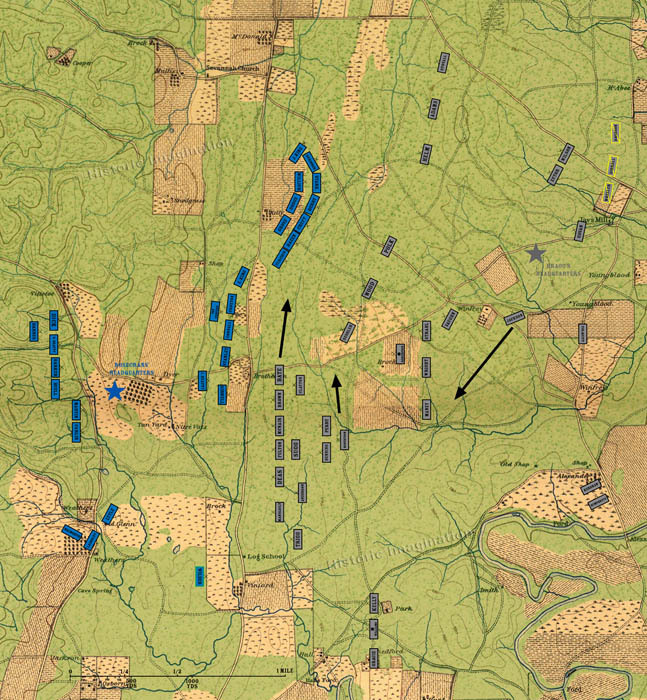 In addition, Jackson’s Brigade of Cheatham’s Division, whose initial location and orientation added to the delay and confusion regarding the dawn attack, moves to a new location at the left of the division line.